Before the general election in 2019, the Abia State Chairperson of the All Progressives Congress, APC, Hon. 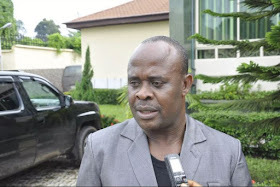 Donatus Nwankpa, has stated that the appearance of Alhaji Atiku Abubakar, as presidential candidate of the People's Democratic Party, PDP, the opposition party's chances of power under no circumstances has it brightened the governing APC. He therefore said that opposition party PDP and its flag bearer Atiku Abubakar have nothing to offer Nigerians when elected to office. Nwankpa, who spoke to reporters in Umuahia, the capital of Abia, on Monday dismissed the idea that the Southeast Zone would vote for PDP in 2018 because Peter Obi, former Anambra governor, was Atikus's vice candidate. He explained that the south-east was doing well under the APC government headed by President Muhammadu Buhari, pointing out that the zone would not support the PDP to return to power, as it has not historically depleted infrastructure in the country have solved. According to the former Abia legislator, "the emergence of Alhaji Atiku Abubakar as presidential candidate of the PDP has not increased the chances of the opposition party. "Because there is nothing new about Atiku, there is nothing spectacular about him. "Let me ask you how many Atiku followers can ridicule us in the Southeast? The important thing today is that the APC government has not neglected the southeastern zone. "Anyone who tells you that Southeast will vote for PDP is a misnomer, a misunderstanding, and the person is still living in the past. Southeast is not part of PDP." "Historically, PDP has not won any genuine Southeastern elections, but the elections were based on manipulating the results and conspiring with security agencies and the electoral authority, and this time the vote will count, one man, one vote."